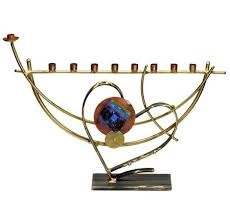 Since the early 1970’s Gary Rosenthal, together with his team of talented craftsmen have been sculpting in welded metals - combining copper, brass, and steel with brilliant fused glass, to create unique, one-of-a-kind, functional Judaic art. 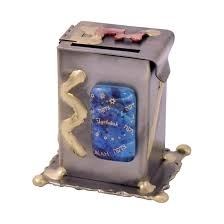 The studio has a long history of employing individuals with special needs. It is part of the company DNA to be a social venture and not just a business. As an example, CSAAC recently selected The Gary Rosenthal Collection for their outstanding employer in Maryland award, in recognition of their 20+ year of experience working with several of their high functioning adult clients. They currently have two amazing long term (15+ years) high functioning adults with special needs on their team. The shop is currently looking to train and hire 2-3 part time employees (1-2 individuals with special needs and 1 volunteer/facilitator) who can assemble parts, shape materials, weave metal and paint to specifications. The shop is open during the week from 9:00am-6:00pm. College age candidates with a flexible schedule would be preferred. It would begin with 3-4 hour shifts 2-3 days a week during the training period with the hope for this to develop into a steady employment. If you are interested in this opportunity please email your phone number and a good time to call to Gary Rosenthal at garyrosenthal53@gmail.com.